Sunday 14th June is a date for your calendar! 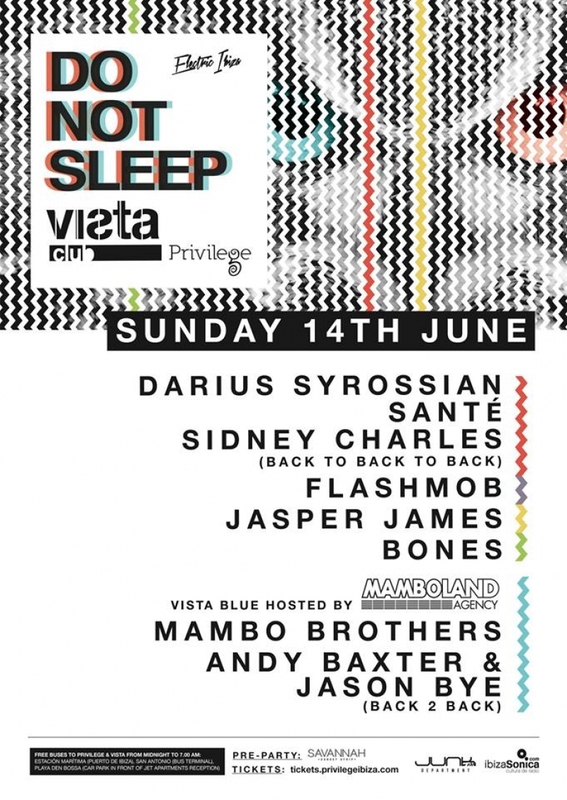 Taking the island by storm Do Not Sleep takes over Vista Room at Privilege in Ibiza with an incredible line up including Darius Syrossian, Sante and Sidney Charles B2B, Jasper James, Flashmob and Bones! We're so happy to be joining this night in the Blue Vista Room as we present our Mamboland Showcase, presenting some of the finest talent on our roster with Andy Baxter (Sankeys, Cafe Mambo) and Jason Bye (Space, Cafe Mambo) playing B2B showcasing their unique style and underground sound. Closely followed by Mambo Brothers, who return to Privilege after their performance at the opening that saw a packed out dance floor still going strong until the sun came up, this is one set you do not want to miss!